The 66RB-2000 Reconnectable Breakaway is designed for use in today's truckstop and high-volume markets. Intended for installation on fuel dispensing hoses, the 66RB will separate at a maximum force of 350 lbs. 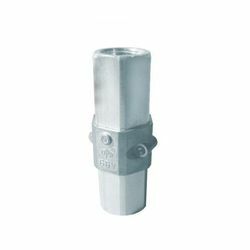 Upon separation, the integral check valves close, stopping the flow of fuel and limiting any fuel spillage from either hose end. For proper operation on high-hanging hoses, the OPW 66RB must always be installed using a "straightening hose" with a minimum length of 12", such as the OPW 66H. For low hose applications, the 66RB should be installed downstream of the retractor cable. 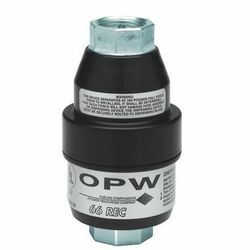 The OPW 66V Series breakaways are designed and rigorously tested for use in today’s fuels. Installed on fuel dispensing hoses, they will separate at the designed pull force, reducing expensive damage to the dispenser and piping system. Internal dual valves close automatically during separation, stopping the flow of fuel from both the dispenser and the separated hose, reducing environmental and health risks of potential spilled fuel. 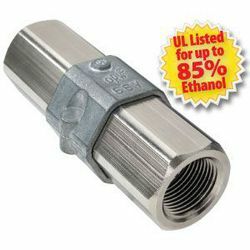 • UL and ULC listed for use in gasoline, diesel, and up to 10% ethanol blends. See specific listings. • Prevents costly damage to dispensers – Pulls apart at less the designed pull force during drive-offs. • Certainty of operation – Designed for single use, so you know it is replaced instead of re-assembled. • Prevents hazardous and costly clean up – Unique double poppet design closes leak path from both dispenser and separated hose side. 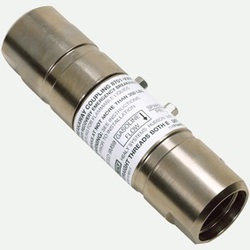 The OPW 66V Series breakaways are designed and rigorously tested for use in today's fuels. Installed on fuel dispensing hoses, they will separate at the designed pull force, reducing expensive damage to the dispenser and piping system. Internal dual valves close automatically during separation stopping the flow of fuel from both the dispenser and the separated hose, reducing environmental and health risks of potential spilled fuel. 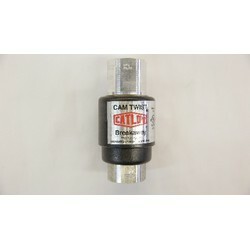 The CAM TWIST Breakaway is the only breakaway that gives you the option to easily disconnect, inspect and reconnect while installed. With a twist the breakaway can be taken apart and inspected for damage, corrosion, and wear without removing the breakaway from service. Designed to be installed between the dispenser and the nozzle. It is simple to inspect the unit. Our unique design seals the internal components before a separation is complete, thus reducing any exposure to product and any environmental impact. With the CAM TWIST alignment and reconnection is easy. Align the two halves together & let the magnets do the work while pushing the unit back together. • Industry-leading, max separation force designed at 350 lbs. 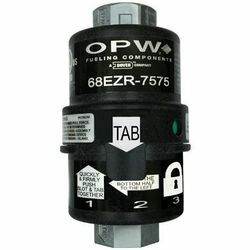 The OPW 66REC is the first dry reconnectable breakaway for the conventional dispensing market. It is designed to be installed on fuel dispensing hoses and will separate when subjected to a designated pull force. The dual valves seat automatically, stopping the flow of fuel and limiting any fuel spillage, while protecting the dispensing equipment. When reconnecting the separated halves, the 66REC seals tightly on an O-ring before the poppet stems engage to open the valve. For proper operation on high-hanging hoses, the OPW 66REC 3/4" must always be installed with a "straightening" hose with a minimum length of 9", such as the OPW 66H. 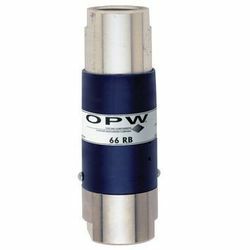 For low hose applications, the OPW 66REC should be installed downstream of the retractor cable. 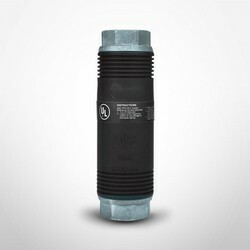 • Coupling Halves – protected by proven plastic sleeves. 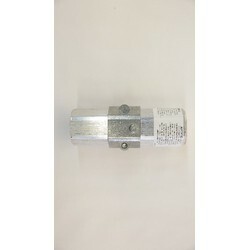 The OPW 68EZR Reconnectable Breakaway has been designed for retail fueling operations to deliver an increased level of security in the event of a drive off. Not only is it the fastest and easiest breakaway in the industry to reconnect, but also the one that delivers the greatest peace of mind that it is securely reconnected. Built on the 66REC breakaway technology platform, the 68EZR delivers trusted OPW quality and proven technology at the lowest cost of ownership. The 68EZR is installed on fuel dispensing hoses and will separate when subjected to a designated pull force. Upon separation, the dual valves seat automatically, stopping the fl ow of fuel and limiting any fuel spillage, while protecting the dispensing equipment. For proper operation on high-hanging hoses, the OPW 68EZR must always be installed with a "straightening" hose, such as the OPW 66H. For low hose applications, the OPW 68EZR should be installed downstream of the retractor cable. 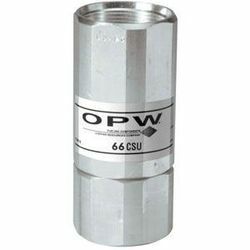 The OPW 66V Series breakaways are designed and rigorously tested for use in today's fuels. Installed on fuel dispensing hoses, they will separate at the designed pull force, reducing expensive damage to the dispenser and piping system. Internal dual valves close automatically during separation, stopping the flow of fuel from both the dispenser and the separated hose, reducing environmental and health risks of potential spilled fuel. Single-use, non-poppeted balance breakaway. Designed for those who desire single-use breakaway protection on balance systems.